Computer issues can be commonplace in manufacturing industries. For example, in steel manufacturing, its work environment has an extreme temperature, dirt, moisture, shock and vibration. Hence, a poorly-protected equipment is definitely susceptible to these damaging conditions. Note that keyboards are essential peripherals for computers. Once it is damaged, it can slow down work progress or even cause further issues that can affect an entire operation. So, it is crucial to identify common problems with keyboards and have a quick fix to these issues. That way, it prevents the problem from escalating which can result in excessive damages. Read on this blog to know some of the common keyboard problems and the easy fixes to these issues. When repairing keyboards, the protocol is first to identify the issue. Is the device no longer functioning or is it just some keys are not working? In identifying the problem, the keyboard connection can be checked by disconnecting or reconnecting it in the same port. For PS/2 keyboard hardware problem, try connecting a known-working keyboard to the port. However, if this keyboard does not work, then there could be an issue with the Motherboard. Meanwhile, for USB-port keyboard hardware issue, try connecting the device directly into the back of the computer. If the keyboard functions, then it means that the USB hub is defective. Once the issue has been identified, then it is easier to find the right solution for defective keyboards. 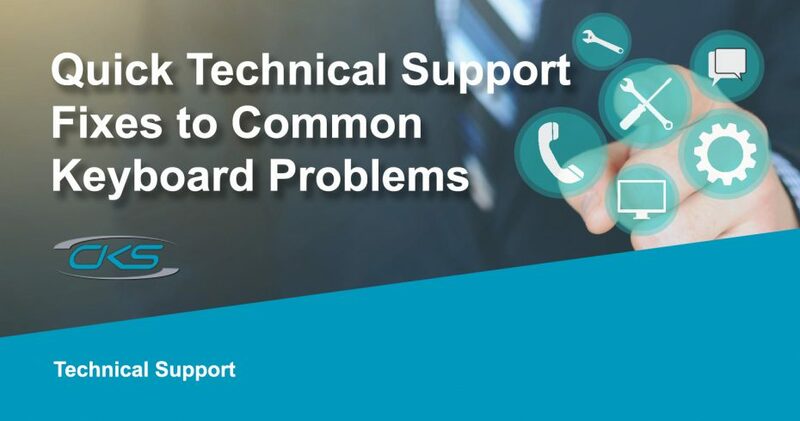 In the next section, get to know the top 5 quick technical support solutions for common keyboard issues. Several common problems can occur with keyboards. Some might be caused by liquid spillovers, software, or hardware issues. When the keyboard is exposed to any form of water or liquid intrusion, the device has to be turned upside down immediately. Ensure that the liquid was drained out. Let it dry before plugging it into any computer. One of the main reasons why keyboards have no input is that the PS/2 keyboard was plugged in the mouse port. Check the connection and see if the device was connected correctly to the port. Also, do note that the peripheral may not be recognised due to outdated drivers. This happens when there are dirt or debris stuck underneath the keys. It can be fixed by carefully cleaning it using a compressed air can. This can blow away the accumulated dirt under the buttons. Another method is to pull out the keys and clean it one at a time. To fix this, check if the Caps Lock Key was toggled. Some keyboards have a light to indicate if this key was active. If so, try pressing it again to revert to its usual typing status. This happens when the peripheral device is not connected correctly. Turn off the computer unit first then unplug and re-connect the keyboard. Once it is connected, reboot the computer, and it should be recognised. Keyboards are prone to damages when exposed in an extreme environment with industrial applications. With the constant presence of extreme temperature or shock, this peripheral device will not optimally perform over extensive periods. Moreover, it would be ideal to opt for industrial keyboards as it is built to last under harsh conditions. Contact a technical support today and find out more about ruggedised keyboards.